A screenshot of Moodle 3.6 with the navigation drawer visible on the left. DELTA recently performed the annual upgrade of Moodle, to Moodle 3.6, for courses starting Summer of 2019 and beyond. While most of the functionality is the same, there are a number of changes implemented in order to improve the user experience. Details of the changes are below and you can attend a What’s New in Moodle workshop if you’d like to see the changes in action. From the Moodle Dashboard, both the student and instructor perspective has changed a bit. You are now able to filter what courses to display: all, in progress, future, past, starred or hidden. You can also sort by either the course name or the last course accessed. Now, you are able to include an image for your course, but there are very specific parameters you must follow in order to use an image. Previously, there was a “Timeline” tab that has been converted into a block on the right side navigation. Depending on the way activity settings are set up within the course itself, this block will show upcoming due dates to students and “due to be graded” to instructors. There are also a few default blocks on the Dashboard page: Private Files, Calendar and Upcoming Events. Use Google Docs and Drive to create and collect assignments, give feedback to students, and share course materials, all within Moodle. Google’s Course Kit comes with assignment and file-embed tools. So, instructors can integrate G Suite’s collaboration capabilities into learning workflows. In addition, grades assigned through Course Kit sync to Moodle. Cloud Poodll for Atto HTML editor is an audio and video recorder for Moodle. 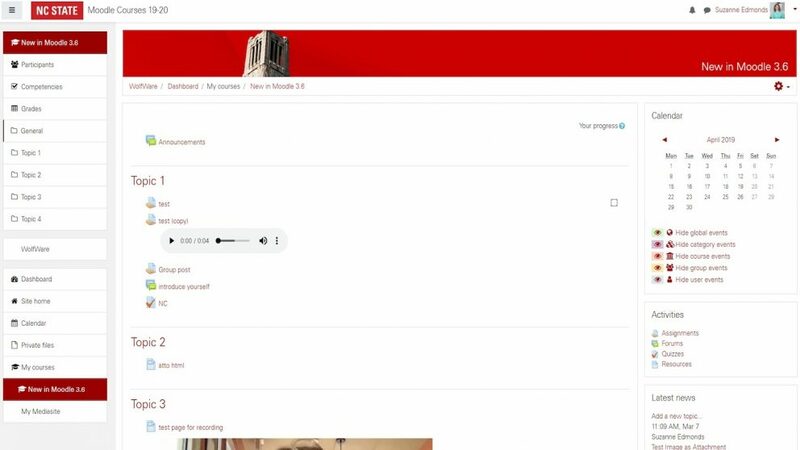 Users will see audio / video record icons in the Atto HTML editor, and it allows you to record audio or video directly into your Moodle content areas. You can record your media, or simply upload media files to the file manager. Video recordings can be automatically captioned in English. This tool can be used to create more in-person communication, such as assignment feedback from the instructors. Moodle has updated the messaging feature. Now, you can message a group in the course. Once you enable the group messaging feature, it is possible for groups in Moodle to have discussions using the messaging interface. A couple of notes regarding this feature: if you want to message someone in the course, you must do a contact request to individual students and/or instructors. Also, only people in the group can message the group; so if an instructor wants to use this feature, they need to add themselves to the group. While it has always been possible to see all course participants on the Moodle page, there is now an option to download the list of participants to your device. There are multiple download options; one of the most favorable will be a table in the form of a comma separated value (.csv) file. In previous Moodle versions, questions could only be exported by an entire category of questions at a time. With Moodle 3.6, you have the ability to export a single question. This makes it easier for instructors who only need to export one question to a different course. With this new feature, it gives you the flexibility of exporting a single question without having to create a specific question category beforehand. When duplicating resources and activities on the course home page, the duplicated items are now appended with the word ‘copy’ so you can easily distinguish between the original item and the duplicated item. Images that are inserted into forum posts will now appear embedded in notification emails instead of just links. This provides the user with better context. For people who use and are interested in HTML coding within Moodle content areas, two new improvements include HTML indenting and syntax highlighting. This is an extended HTML plugin for the Atto HTML editor which adds source beautification. For example, when users enter a wide range of content such as numbered and/or unordered lists into the editor, the resultant HTML source is colored and indented; this makes the HTML source code easier to read. Want to get more hands-on experience with Moodle and other tools? Check out our remaining DELTA Spring Workshops! 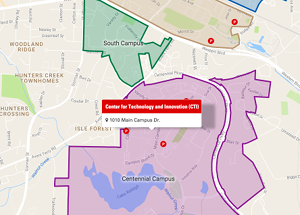 Save the dates for our annual Summer Shorts in Instructional Technologies program August 12-14.